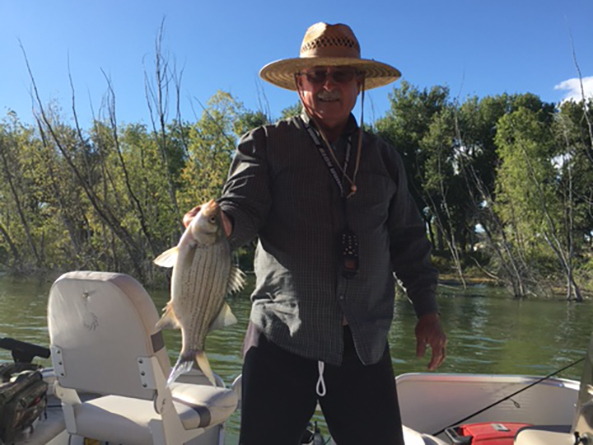 Above: Sen. Erdman displays his catch of the day at Lake Minatare in western Nebraska. With the exception of his college years, Sen. Steve Erdman has lived in Morrill County his entire life. The new senator went so far as to move in with his grandparents at the age of 16, when his parents moved to Washington state, in order to stay in western Nebraska. It’s been a good fit. A life-long farmer, Erdman briefly thought he wanted to be an engineer and took the preparatory coursework while attending Nebraska Western Junior College. Instead, with the help of an uncle, Erdman began a 42-year career working the land. At one point, all three of his and wife Cathy’s sons also were involved in the operation. A significant drought in 2002 and low commodity prices in 2004 caused the two oldest sons to rethink their career paths, however — a choice the senator understood. “It’s a hard life. It’s very rewarding, but it’s a hard life,” he said. To balance that life, Erdman became deeply involved in 4-H and FFA while his sons grew up. Craig, Philip and Nicholas all excelled in the programs, he said, and there was no shortage of pride in their achievements. Erdman’s first foray into public service was inspired by his family. Concerned with the quality of his sons’ education, he decided that it was time to “put up, or shut up,” so he ran for a seat on the board of their Class 1 school. Erdman later served on the Bayard School Board for 12 years, and that service led to 12 years on the Morrill County Board of Commissioners and many additional boards. The ability to see issues that needed addressed and tackle them head-on was what he liked best about being a county commissioner. The work of a state senator has proven challenging in that regard, Erdman said. He recalled the one piece of advice offered by his middle son, Philip, when the elder Erdman was considering running for a seat in the Unicameral. The other challenge, he said, is reconciling the interests of the urban and rural parts of the state. Erdman spends as much time as possible with his nine grandchildren: four in Lincoln, four in Kearney and one in Gering. When asked if there is a politician that will serve as a role model for him while at the Legislature, Erdman answered immediately.